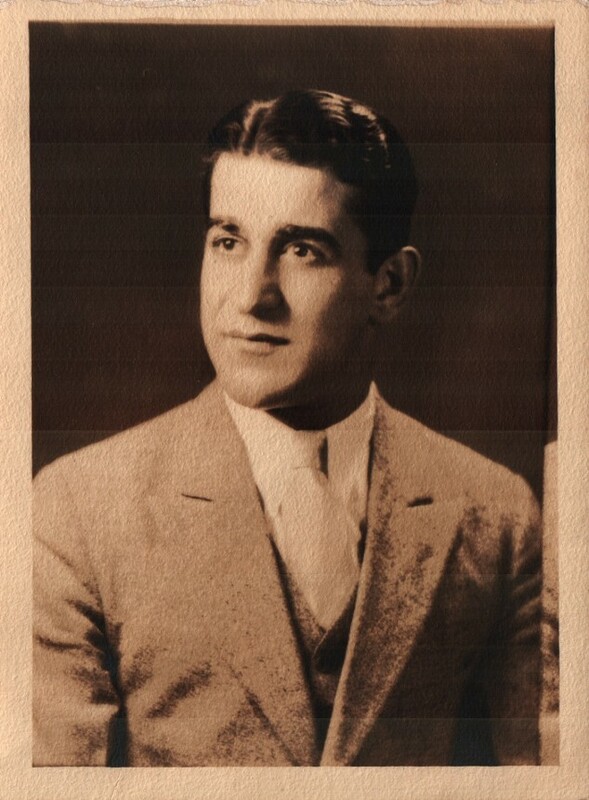 Edward George SABA23 (Fadlou and Rose / Michael and Talgie) was born on 26 Jun 1909 in Windham, Windham, Connecticut, USA and died on 5 Jan 1988 in Windham, Windham, Connecticut, USA at age 78. The cause of his death was Acute myocardial infarction due to Ischemic heart disease. Edward G. Saba, 78, of Willimantic, a renowned high school and college athlete in the late 1920’s and early 1930’s died Tuesday at the Windham Community Memorial Hospital after a brief illness. He was born June 26, 1909 in Willimantic, son of the late Fadlou and Rose Kirshy Saba and was a lifelong resident. He was a three-sport athlete at Windham High School from 1925-1928, starring in football, basketball and baseball. He was a quarterback on the football team, and was named to the All Eastern team twice; and played on the first Windham High basketball team to make it to a state tournament, in 1926-1927. He spent two years at Vermont Academy preparatory school, where he starred as a quarterback and halfback. Vermont was U.S. prep school champ in Saba’s final year there. He then went on to the University of Vermont, where he starred as a halfback and quarterback. He played varsity football from 1932-1934, and was the team’s leading scorer for those three seasons and in 1933 was an All New England selection. After college, Saba played for the Providence Steamrollers of the Eastern Football League in the early 1930’s and for the Bristol West Ends. In October 1976, he was inducted into Vermont Academy’s Football Hall of Fame. He was married to the late Wanda Niemiec Saba. He is survived by a brother, Phosy Saba of Willimantic; and several nieces and nephews. He was associated with his late brother, Alfred Saba, in the operation of Saba’s Cleaners on Main Street in Willimantic. Saba–Edward G. Funeral procession will be held from the Potter Funeral Home, 456 Jackson Street at 9:30 a.m., with a mass of Christian Burial at 10 a.m., in St. Joseph’s Church, Willimantic. Burial will follow in the Old Willimantic Cemetery. Calling hours are Thursday, from 7-9 p.m. In lieu of flowers, memorial contributions may be made to the Windham Community Memorial Hospital. Funeral services for Edward G. Saba, 78, of Willimantic, who died Tuesday, were held 9:30 a.m. today from 456 Jackson St. with a mass of Christian burial followed in the Old Willimantic Cemetery. The bearers were Scott Saba, Craig Saba, Robert Saba, Mitchell Saba, Chris Grant and Todd Grant. Chad Saba served as honorary pallbearer. Edward and Wanda had no children. Edward’s BC originally listed his name as Edward Eli. It was corrected 22 Sep 1939. Edward married Wanda Josephine “Sunny” NIEMIEC,24 daughter of John NIEMIEC and Catherine ZIEMBA, on 14 Oct 1939 in Rockville, Tolland, Connecticut, USA. Wanda was born on 8 Jan 1917 in Rockville, Tolland, Connecticut, USA and died on 4 Mar 1984 in Windham, Windham, Connecticut, USA at age 67. The cause of her death was Myocardial infarction due to Coronary Arteriosclerosis. Marriage Notes: Volume 1926-1939 Town of Windham, CT Marriages, Page 8. Marriage Certificate states they wed at Saint Joseph’s Church in Rockville, CT.
Wanda Niemiec Saba, 67, of 15 Old Plains Rd., Willimantic, died Sunday at home. She was born in Vernon and lived in Willimantic for the past 35 years. She is survived by her husband, Edward G. Saba; a sister, Mrs. Jane Grous of Vernon; and several nieces and nephews. Funeral services for Wanda N. Saba, 67, of 15 Old Plains Road, Willimantic, who died Sunday, were held today at 10:30 a.m. from 456 Jackson St., Willimantic, with a mass of Christian Burial in St. Joseph Church at 11 a.m. The Rev. John Nash was the celebrant. Burial followed in the Old Willimantic Cemetery. Bearers were Scott Saba, Craig Saba, Mitchell Saba, and Phosy Saba. Evidence of that Saba Luck!